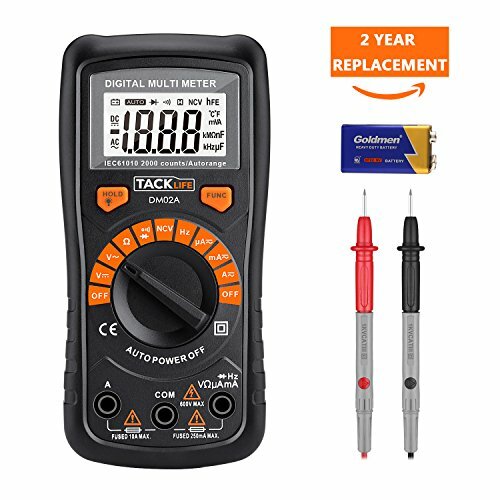 Tacklife's DM02A Digital Multimeter is a practical tool for electricians, hobbyists, and general household use. A compact and handy device to pinpoint everyday electrical issues around the house with safe and user-friendly operation. LED Low Battery Indication.If the meter is idle for 15 minutes (idle time), the meter automatically turns off. Large Backlit LCD Screen, provide clear display. Auto Ranging 2000 Counts with Max Value Hold / Data Hold Function. This Meter is designed to meet IEC61010-1 & CAT II 600V over voltage category and double insulation. It's tough rubber sleeve protects it from the drops and falls associated with the toughest jobs.